APR stands for Annual Percentage Rate, and is the method most credit card issuers use to express your interest rate. Most (if not all) issuers calculate your interest charges by using the average daily balance, now that two-cycle billing has been outlawed. You can get a rough idea as to what you’ll pay in monthly credit card interest (finance charges) by multiplying your APR by your balance, and dividing it by 12. So if you carried a steady $2,000 credit card balance, you’d pay roughly $33 a month, or $400 annually. Of course, this is simple math, and doesn’t take into account compounding interest, your average daily balance, your minimum payment, and so forth, but it should give you a general idea of how credit card APR is calculated. So how do credit card issuers come up with your APR anyways? Well, like any other type of loan, it’s based on your creditworthiness. That means your credit score will come into play big time. So those with excellent credit will get the lowest APR, and those with just average credit scores will be stuck with the highest APR. Credit card issuers assign APR this way based on default rates – in short, those with higher credit scores default less, so they can be charged less interest. Credit card APR may be variable or fixed. Most credit cards these days come with variable APR, meaning the interest rates changes whenever the associated index (e.g. prime rate) changes. This means credit card APR can move up or down. There are some fixed rate credit cards out there, where the credit card APR never changes. But they’re becoming less and less common. Your purchase APR is what you’ll pay in the way of interest on any purchases you make that aren’t paid off in full before you due date each month. If you pay in full every month, no interest is due, so your credit card’s APR will never really come into play. Many credit card issuers also offer 0% APR on purchases for a promotional period, typically ranging from six to 12 months. 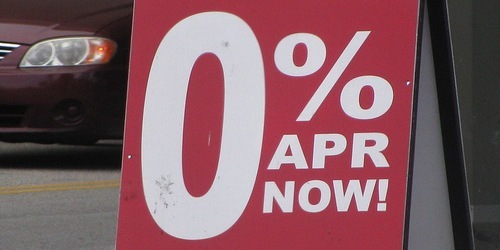 During this time, your APR will be 0%, meaning no interest is charged. After the promotional period ends, you will be charged interest on any remaining balance in subsequent months. Many credit cards also come with a balance transfer APR, which is the interest rate attached to any balance transfer you execute. Typically, credit card issuers offer 0% APR for a period of 12 months or longer, and then the balance transfer APR turns into your purchase APR. Again, any balances that were interest-free will be subject to your purchase APR, so it’s best to avoid carrying a balance after the promotional period. Most credit cards give you the option to pull cash out of ATMs, though the APR tied to these transactions is usually sky-high. And interest tends to accrue the minute you pull the cash, so these are best served as a last resort, if that. Avoid. There’s also penalty APR, which is applied if you don’t make your minimum payment on time or make a payment that is subsequently returned. Generally, this will be the highest your credit card APR can go, and can be in the 30% range or higher. If you happen to go over your limit, you may also be subject to overdraft APR, which is typically the same as your cash advance APR. In summary, you’ll want to avoid all these credit missteps to avoid being charged an arm and a leg. And again, if you pay your balance in full each month, the credit card APR will never matter, since you won’t be subject to any interest charges. Keep in mind that charge cards don’t have an APR because they are expected to be paid off in full each month. As a result, no interest is charged on these types of credit cards. What’s a Good APR for a Credit Card? What I can say definitively is that credit card APR is generally very high, if not astronomical, compared to other interest rates, such as those on mortgages and auto loans. For example, long-term fixed mortgage rates are averaging around 4% at the moment, a historical low to be sure. But this compares to an average rate in the teens for credit card interest rates. And just last week, interest rates on new credit card offers were at record highs, per the Weekly Credit Card Rates Report from CreditCards.com. Yep, the national average credit card APR was 14.94% – that’s more than three times the average rate on a mortgage. Ouch. In short, you pay a lot for the privilege of carrying a credit card balance, which is a major reason why you should never carry one! For a so-called “low interest” credit card, the average APR was 10.73%, still sky-high in the grand scheme of things. Even balance transfer credit cards had an average APR of 12.73%, which surely doesn’t make a lot of sense when there are plenty of promotional 0% APR balance transfer credit cards out there for the taking. And even no fee balance transfer credit cards. If you happen to have bad credit, the average APR is a staggering 24.96%, all the more reason to pay closer attention to your credit score! Regardless of these numbers, my general recommendation has always been to avoid carrying a credit card balance, largely because of these very (high) interest rates. They’re absurdly high, and should be avoided at all, ahem, costs. It’s simple. APR is nothing you have to worry about if you never carry a balance. Previous Previous post: What Credit Card Limit Can I Get?